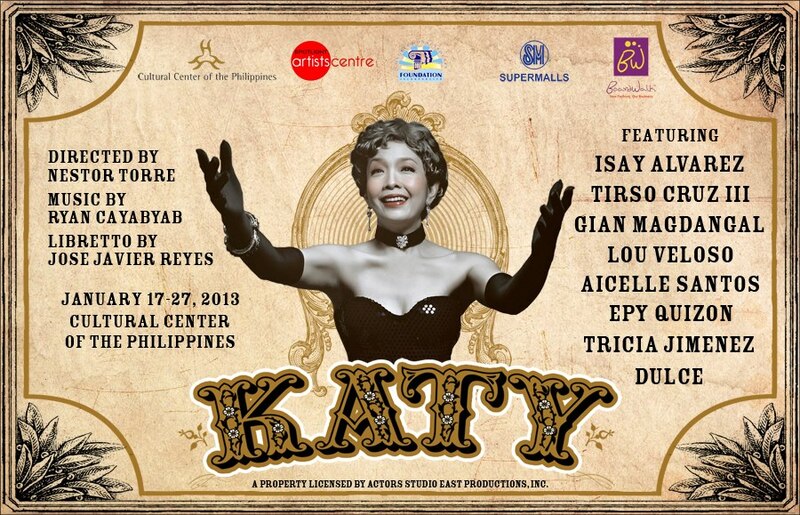 Many musical-theater buffs in Manila are looking forward to the revival staging at the CCP Little Theater of the hit Filipino musical "KATY", one of the colorful life and times of the country's queen of jazz and bodabil, Katy Dela Cruz. 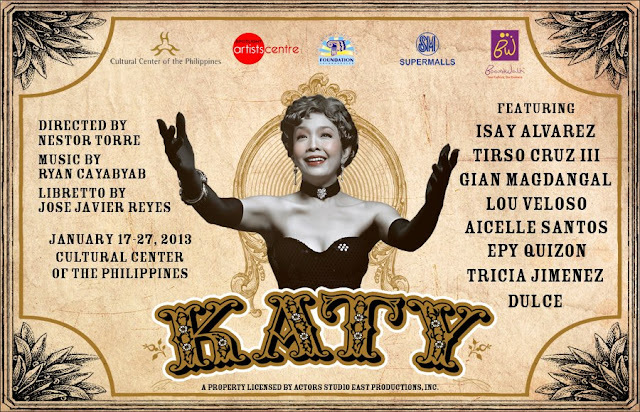 The musical will highlight Katy from a child protege singing in fiestas, cockpits, movie houses to Teatro Lux, Grand Opera House and later on San Francisco USA. This musical produced a number of unforgettable songs like: MUNDO AY ENTABLADO, Ababa Boogie, MINSAN ANG MINAHAL AY AKO, SARI SARING BABAE, BALUT and many more. When it was first performed in the late 1980's, it was acclaimed as the cultural event of the year, and some aficionados hail it, the best Filipino musical-theater production ever mounted, with top creative talents, like director Nestor Torre, scriptwriter-lyricist Joey Reyes and composer Ryan Cayabyab. 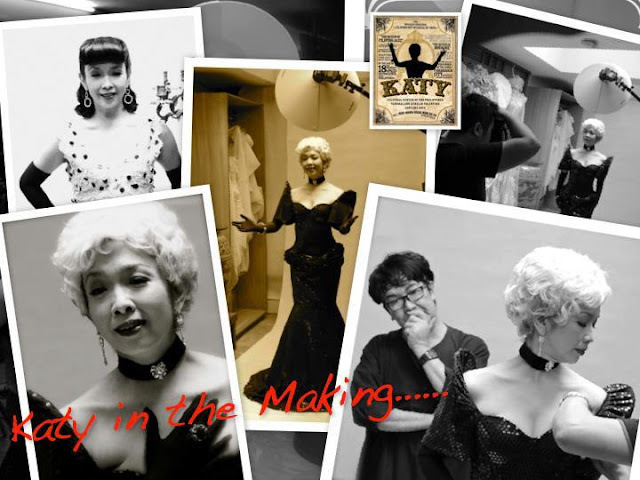 The glittering and acclaimed musical's revival staging in January 17-27 2013,, is a Cultural Center of the Philippines & Spotlight Artists Centre production, with Isay Alvarez playing the plum lead role. 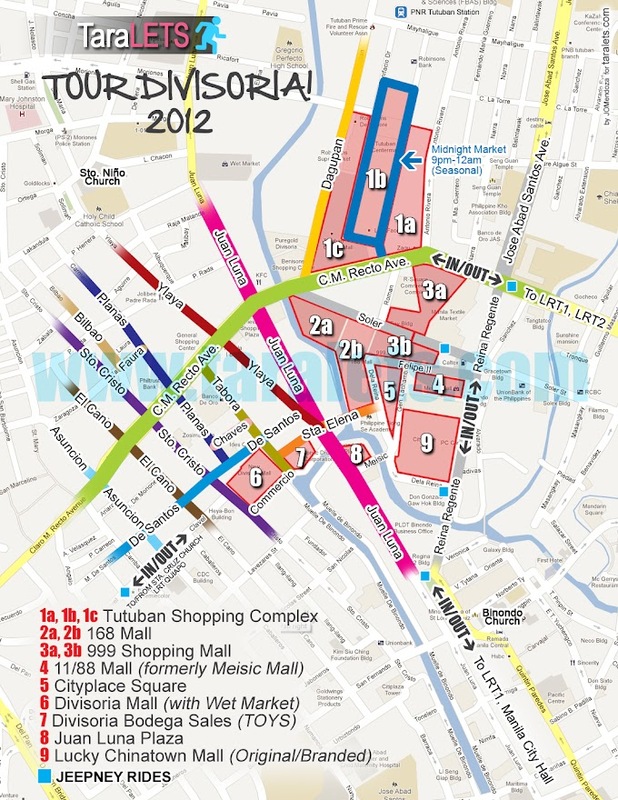 Other stars include Dulce, Tirso Cruz III, Tricia Amper-Jimenez, Epi Quizon, Aicelle Santos, Lou Veloso and many more. SCENE 11 : WELCOME HOME KATY! • Are you the next Katy dela Cruz?